Last Sunday, Penny and I got to hang out with this amazing couple. You know this already but for the sake of affirmation, CFCOG is greatly blessed to have Kevin and Crystal Elworth on staff. Kevin and Crystal have served in the United Worship Experience for seven years and have led us in making significant connections with our community. During that time, God has blessed both UWE and the Elworth family with “exponential” growth. Now with five children of their own and over 500 people who call UWE their church, it is evident that their hearts beat with the desire to help as many people as possible take their next steps to find and follow Christ. As we sat at the table yielded to our yogurt, we talked about life, family, the amazing privilege of working at CFCOG, and the pending multi-site campus ministry. I have to tell you that this conversation unquestionably affirmed the call for Kevin and Crystal as the ones to lead our first off-campus ministry. 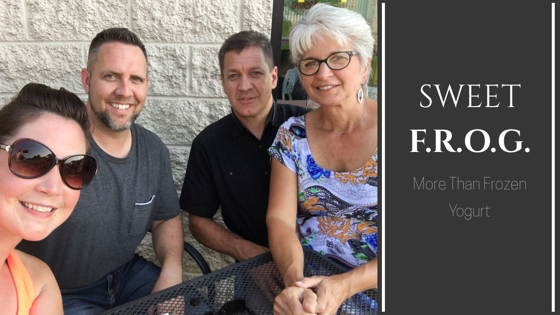 This is not without a conflicted spirit on their end because they love UWE, but it is with a calling to work with a group of CFCOG members to build a ministry that connects the “unconnected” to a faith community. By no means is this a matter of Kevin and Crystal leaving us but rather leading us in this part of the 12:24 Vision. I am so encouraged by Kevin and Crystal and admire their commitment and courage to lead this charge and do pray for the team that will partner with them. Some of you have already sensed the call to “go” and serve at the new location and others are still waiting and wondering what your role might be. Early in September, we hope to be sharing the details of the multi-site outreach and how the entire church can be a part of this adventure. Honestly, this whole F.R.O.G. thing (fully relying on God) is not easy for those of us who want to know now how this is all going to work. That’s why we are asking for 200 people to join us in praying faithfully for this work. If you have not yet joined that prayer team, let Kevin know (kevin@grandpoint.church), and he will include you in the details.